The key research objective of MgSafe is to develop and optimise imaging technologies for recently established Mg implants by quantifying their physical impact and suitability for this class of materials in future human applications. Highly sophisticated imaging techniques (nano and μCT, MRT, PET, USPA, IR) will be further developed beyond the forefront of medical device production in vivo and with in situ labelling options to obtain as much information as possible over time. The aim is to deliver non‐invasively data on different time and length scales of the body reaction and material behaviour during Mg degradation with a precision and plethora of details, which is currently not available. Two Mg‐alloys (provided by Partner Organisation BRI.T) and implants (provided by SYN) will be used. These implants will be studied in parallel in rats and sheep (the same animal models for all partners undertaking in vivo studies). For the larger implants, dummy studies ‐ as required for biomedical approval ‐ will be performed (following ASTM rules). The obtained multimodal imaging data will be combined with molecular biological/biochemical analysis, including NMR‐based metabolic phenotyping, thereby increasing the information about physiological changes without using additional animals. An additional dimension will be added by the analysis of explants to obtain highest resolution chemical and material science data. All relevant biological and chemical in vivo and ex vivo data will be merged by computational 3D methods, simulations and machine learning approaches. The combination of these results will not only allow for an upscaling of the processes towards humans but will also deliver valuable data in terms of patient safety. MgSafe combines fundamental research aspects addressed by the academic and clinical beneficiaries with translatory aspects and patient safety, which is assessed by the non‐academic beneficiaries. The research programme is structured in four research work packages (WPs 1‐4), supported by three training WPs (5‐7) and one management WP8. WP1 “Imaging Hard Tissue Remodelling” (ESRs 1‐4) provides information about the physiological changes close to the Mg implant during degradation in rats and sheep in vivo by combining CT with fluorescence imaging or histomorphometry and molecular probes and Magnetic Resonance (MR)‐based metabolic phenotyping (beneficiaries MUG, UiO and UGOT). WP2 “Imaging Soft Tissue Remodelling and Inflammation” (ESRs 5‐8) delivers longitudinal 3D physiological measurements in rats by MRT/MRS,multimodal PET/MRT, USPA, and IR (MHH, CNR‐IFC, VSI and OsloMet). 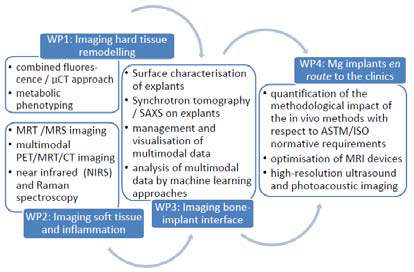 This is complemented by WP3 “Imaging Bone‐implant Interface” (ESRs 9‐12), where explants delivered by WP1 and 2 will be studied. Beside a thorough material assessment high‐resolution synchrotron tomography and scanning small angle X‐ray scattering (SAXS) will also be performed in this WP, and beneficiary SCANCO will develop software to merge the multimodal data available in WPs 1‐3. 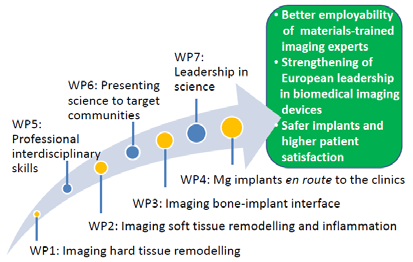 WP4 “Mg Implants en route to the Clinics” (ESR 13‐15) will guarantee the inclusion of translational and patient safety aspects. On one hand, the impact of e.g. MRT analysis on the material will be studied and minimised. On the other hand, a hand‐held USPA device will be optimised to image Mg degradation and monitor the functional changes in tissue (inflammation/angiogenesis/oxygenation).